Essentially, it’s good practice to run through the codes on the VIN, fender and door tags for a muscle car you potentially want to buy. The best conditioned vehicles should have this done for you in some form of paperwork, but if you’re looking at a barn find car you’ll have to potential do the work yourself. Option code M46 on a ’70 Cuda was a Elastomeric rear quarter-panel air scoop in front of the rear wheels, along with matte black lower-body trim with white and red pinstripes. Apparently only 450 were built. Option code 674 on the 1968 GTO came in the form of a Endura polyurethane foam front bumper which had a steel core. Only 2108 GTOs were produced in 1968. Only 2700 Dualtone paint version of the XL were produced, but could be found in a number of colour combinations. 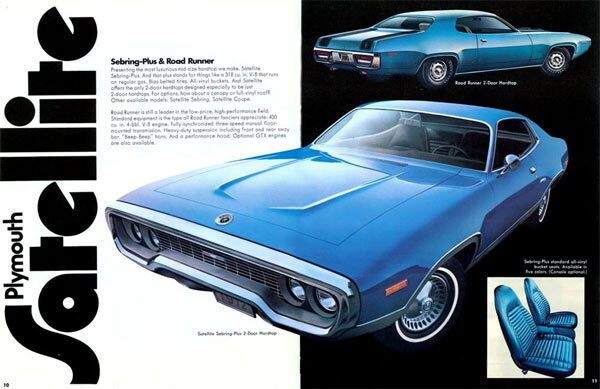 Codes V21 and V25 are were the options of twin flat-black hood/rear deck stripes when the Air Grabber hood was ordered. The base Satellite, Sebring and Sebring-Plus could also be ordered with these options. This option was available for the Skylark 350 hardtop. It included a vinyl folding sunroof available in white, black, sandalwood, tan, brown, or green and the choice of carpet colours – bright gold or bright red, although black or sandalwood. American Sunroof Corporation performed the work and said there was around 1127-3943 produced and 6 GSs. Vacuum operated exhaust (VOE). Around 233 built, 212 hardtop coupes and 21 convertbiles all with YS” 400ci/350 hp V8 engines. 455HO engine and a tach on the hood.